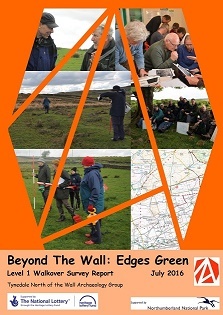 Tynedale North of the Wall Archaeology Group, made up of local community volunteers, has been engaged on a long-term study of the archaeological remains found in the landscape immediately north of Hadrian’s Wall since its inception in 2013. We have carried out detailed archaeological surveys at Ravensheugh Crags, Standingstone Rigg, north of Sewingshields Crags and at Davy’s Lee with support from Northumberland National Park and the North Pennines AONB Altogether Archaeology Project. This work has identified many new sites and confirmed that there is a great deal of archaeological evidence of over 4,000 years of human activity in the area. The 300 years of Roman occupation covers only a fraction of the story of those who have lived and worked in the area since prehistoric times. There is a strong tradition of archaeological survey and excavation in the area of the National Park by local people observing and mapping the remains of over 5,000 years of archaeology.